Add an element of sophistication to your guest room with this wonderful Waterford lamp. This lovely lead crystal table lamp features a large, round base thatll stand out as a stunning piece of crystal, not like any ordinary lamp. Youll love how the beautiful base showcases a classic wedge cut pattern and is accompanied by a white silk coolie shade for a sensational look. Place this beauty on a nightstand for the perfect reading light for your guests! Material: Lead crystal and base metal. Bulb Type: One 100-watt Type A "3-Way" bulb (not included). Care: Clean metallic parts by applying a dry, soft duster only. Use crystal cleaners for crystal parts in the recommended concentration. Dry with a soft, clean cloth. Shop for special offers in our Daily Deals department! Check back daily for new deals! 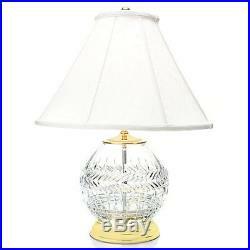 Waterford Meg Rose Crystal Bowl Wedge Cut Table Lamp w/ Silk Coolie Shade. This item is new but has been re-boxed into a brown box. Condition: New Other (see notes) What's in the Box: One Lamp with Shade Packaging: Brown Box (no retail packaging). Packages are insured and include tracking at no additional cost. If you would like another size or style please place that order from the inventory available online. Every single customer is important to us and we appreciate the opportunity to assist you with any issues directly. 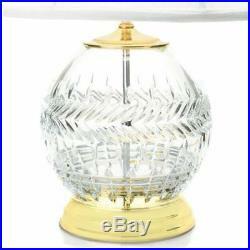 The item "Waterford Meg Rose Crystal Bowl Wedge Cut Table Lamp with Silk Coolie Shade" is in sale since Thursday, October 11, 2018. This item is in the category "Pottery & Glass\Glass\Glassware\Waterford". The seller is "worldsbestdeals" and is located in Minneapolis, Minnesota.